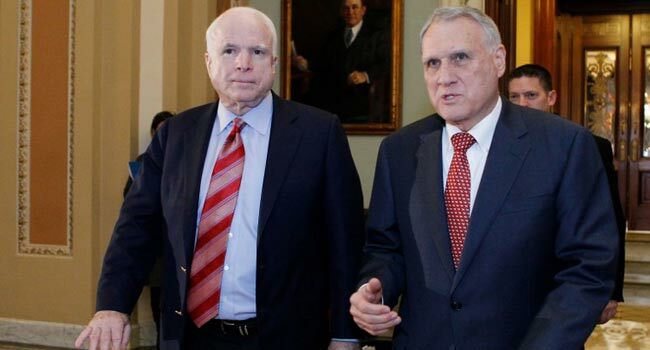 Arizona’s governor on Tuesday named former US Senator Jon Kyl as the temporary successor to late senator John McCain, appointing a respected and powerful former Republican lawmaker to the post. “There is no one in Arizona with the stature of Senator Jon Kyl. He is a man without comparable peer,” Governor Doug Ducey told reporters in Phoenix, with Kyl at his side. Kyl, 76, was to fly to Washington to be sworn in possibly just days before a high-stakes Senate vote on the confirmation of Brett Kavanaugh, President Donald Trump’s pick to be the next US Supreme Court justice. Ducey insisted his appointment was not political, despite Kyl working closely with the White House in recent months on getting Kavanaugh confirmed in the Senate, where Republicans hold a razor-thin one-vote majority. Kyl, 76, served for 18 years alongside McCain in the Senate, until 2013, and said he would be “honored” to return to the chamber. But he only committed to serve until January 2019, raising the prospect of requiring Ducey to again appoint a replacement until the seat is up for re-election in November 2020. “I’m hoping that the senator will consider serving longer” than this year, Ducey said. Widow Cindy McCain said it was a “great tribute” to her late husband that their close friend Kyl will return to public service by assuming McCain’s seat. McCain died late last month at age 81 following a yearlong battle with brain cancer. His funeral service Saturday at Washington National Cathedral was in many ways a stern rebuke of Trump, with presidents George W. Bush and Barack Obama eulogizing McCain as an iconic statesman who embodied passionate but civil debate, bipartisan compromise and a commitment to American values.